In other words, healthy pet, healthy pet owner. Moffenbeier started out as a cat lover. Around age 8 she started accompanying her mother when she took the family cat down to, of course, Parkway. This was not unusual. What was unusual was that the fascination of treating animals’ medical problems took hold of her so strongly that it set her on the path to her profession. A milestone occurred in third grade when Moffenbeier was assigned a career day project. Naturally, she chose becoming a veterinarian. Takashima was the vet who helped her. At that point Moffenbeier had a mentor and Takashima had a protégé. She never stopped going to Parkway, doing any job that was asked of her and observing treatment of animals at every opportunity — through graduation from Lakeridge High School and going through both undergraduate and graduate programs at Oregon State University. “Choosing to become a veterinarian was a very clear thing for me,” Moffenbeier said. “I loved animals, science and medicine. Treating animals is sort of like a puzzle because they can’t tell you what is wrong with them. It keeps me interested and it’s also extremely rewarding. 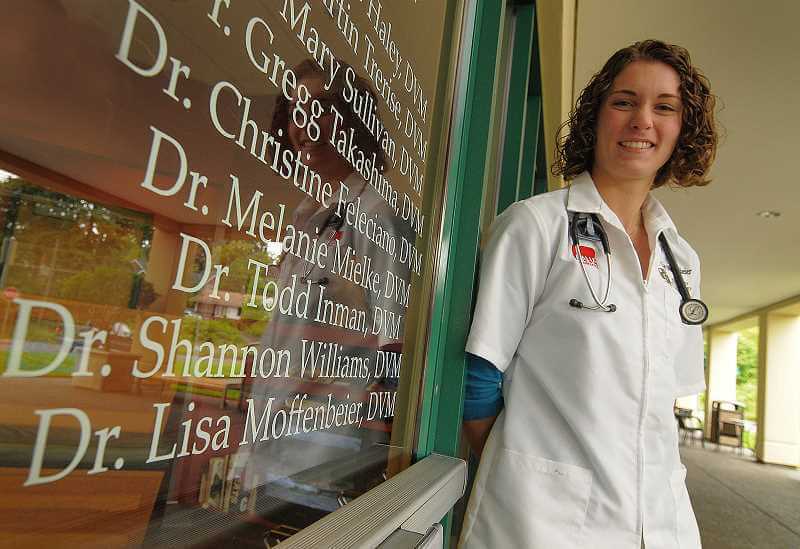 Upon graduating with her doctorate of veterinary medicine degree from Oregon State University, Moffenbeier got a crash course in the animal medical world by working in a 24-hour veterinary clinic in Utah. An experience like this tends to separate true veterinarians from people who are merely fond of animals. Moffenbeier loved it. After about a year in Utah, Moffenbeier got a chance for the perfect job: an offer to join the staff at Parkway. Last May she became the newest member of Takashima’s team. Many of her cases have been routine, but sometimes she must become a veterinarian detective. It is always a good sign when your patients start running around, and Takashima thinks Moffenbeier has a great future at Parkway. Her only career goals at this time are to increase her ability “one skill at a time,” especially becoming proficient at noninvasive surgery techniques, where animals not only don’t have to go under the knife but also have amazingly brief recovery times. Moffenbeier has learned that lesson, too. On her day off she saw a stray dog run in front of her car as she was driving down the street. She got out of her car, grabbed the dog and was quickly able to find its home. Moffenbeier’s life is going to the dogs. She likes it that way. Parkway Veterinary Hospital is located at 3 SW Monroe Parkway, suite 5, just down from New Seasons market. For more information, call 503 636-2102 or visit parkwayvet.com.